Cogeneration or CHP (combined heat and power) is the process of recovering exhaust heat that is usually wasted when an engine runs to produce electricity or other process. The captured BTU is transferred back into a desired heat sink: water, glycol, therminol fluids or steam production. Tremendous savings result due to reduced fuel consumption as well as the elimination of related pollution. Suitable fuel types for combustion sources include natural gas, propane, digester gas, diesel fuel and light to heavy fuel oils. 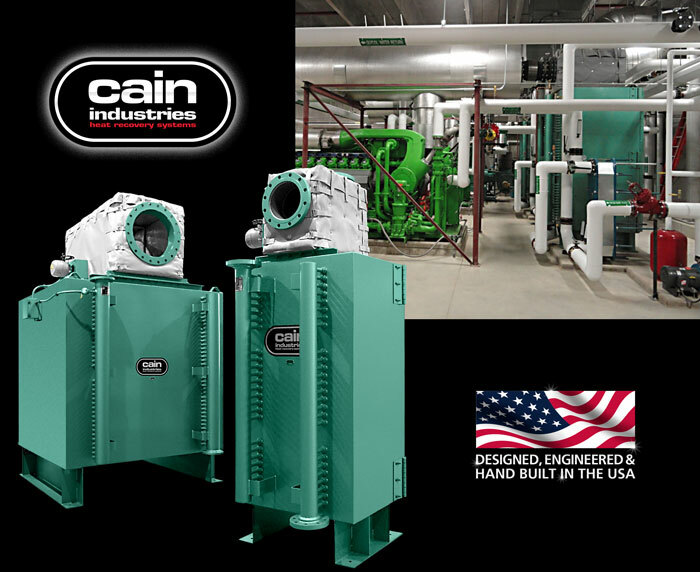 Cain Industries manufactures heat recovery product lines for gas and diesel engines, gas turbines, and micro turbine generator retrofit applications. For these applications, we offer over 500 standard products to choose from and can typically provide a comprehensive analysis and quotation to fit your exact needs within 48 hours. Our equipment can be adapted and assembled to fit any application or complete installation. Tremendous fuel savings typically pay for equipment and installation within 1 to 3 years of average use. Pollution reduction due to lowered annual fuel usage. Lower exhaust temperatures and significantly reduced sound output levels (final sound attenuation is typically 15 - 25 dBA). The fully packaged ESG1 is selected from 124 pre-engineered standard models with output capabilities of 20 to 300 boiler hp and operating steam pressures from 3 to 450 psig. The ESG1 is shipped complete, ready for operating as either a primary or supplementary steam source. Engine exhaust BTU is transferred to a high flow superheated water/steam mixture. The superheated water is returned to the steam drum which contains dry pipe, baffles, and lance assemblies, where it flashes into 99% dry stream as its exits out to the system. As the water is generated into steam and exits the boiler, the modulating boiler feedwater system controls continuous feedwater flow for constant drum water level control. Fail safe controls are built in for full exhaust bypass in the event of electrical or pneumatic loss. The steam pressure controller maintains the operating steam pressure as it controls the modulating exhaust bypass assembly. This provides solid operating steam pressure under various operating steam load demands. The UTR1 is applied primarily where confined area restrictions vs. heat transfer requirements must be considered as a priority to the combined features of the HRSR. Its compact industrial design allows for maximum BTU recovery relative to the space allotted for installation. Finned tube spacings range from bare tube heating surface up through 8 fins per inch, depending on the fouling factor requirements. Standard fin to tube attachment using the nickel braze/weld fin to tube process allows no fin to tube separation to 2,000°F. The UTR1 can be located above the engine or on the floor for convenient installation. With over 170 standard configurations to choose from, the UTR1 can be designed to meet the closest pinch point requirements when installation space is not an issue. Easy access allows for quick removal of finned tube rows or core assemblies without disturbing the exhaust gas connections and allows for routine inspections and/or cleaning requirements. The HRS Radial waste heat recovery silencer is a module configuration package with 176 standard models available. It packages standard features such as: full exhaust bypass, full heating surface access, factory insulation, hard shell exterior, stainless interior, 3" thickness factory insulation, and a variety of finned tube types and fin spacings to fit the proper application. The HRSR is designed to receive the total exhaust and liquid flow from a single source and control exit temperatures to the desired performance levels. During full operation, the radial design channels the exhaust flow through an hour glass expansion flow pattern which provides for significant dBA reduction. The full port exhaust bypass is located at the top for convenient installation. Depending on space considerations, the unit may be installed in the horizontal position as shown below. The unique configuration of the single row design heating surface allows for reduced fouling potential. The full access to the core with optional hinged doors also allows for fast routine inspection and/or manual cleaning. Finned tube replacement requires no overhead cranes, special rigging, special crews, or extra roof height above the unit. Individual finned tube replacement, if required, is fast and easy with minimum downtime. Specifically designed for small engine sizes, the HRSA waste heat recovery silencers are compact cylindrical heat exchangers designed for either dual or single exhaust small engines. There are 65 standard models available to meet the specific design-performance criteria. In addition to lowered exhaust noise, the unique coil type configuration and optional circulating pump allows for a secondary circulating liquid flow system. 1" NPT interconnecting piping, to and from a main liquid flow loop, provides for simple and less costly special piping modification changes. The required heat transfer surface coupled with a small water flow diversion from the main flow adequately recovers desired BTU/hr performance and controlled outlet exhaust temperatures as required. An optional internal or external stainless steel exhaust bypass can also allow tempering or full control of the exit temperature when required. The HRSA design utilizes full counter flow heat transfer for achieving very low outlet exhaust gas temperatures. All stainless steel construction for specific condensing applications is available. The HRSA can be mounted vertically or horizontally as required. The HRSA with its lightweight construction and cylindrical configuration, lowers the exhaust from 1,000°F to 300°F with a 25 dBA reduction while operating with natural gas or diesel fuel oil. The UTR is applied where both rectangular configuration and heat transfer surface vs. performance is critical. The UTR can be located within the engine to meet crucial space limitations. There are 44 standard models available for selection to fit the most compact of spaces. With flexible exhaust gas connection sizes and locations, the UTR can adapt easily to an OEM packager's design needs. The capability of removing the core assembly without disturbing the exhaust gas connections makes cleaning and inspecting the finned tubing efficient. This is especially important when the combustion is a fuel oil type and could foul the heating surfaces. The rugged heat transfer core is made from SA178 boiler tubing and .25" thickness high grade carbon steel heater assemblies. The heat transfer materials can also be constructed of all stainless steel when exhaust temperatures entering exceeds 1,250°F or when liquid temperatures entering are below 120°F. 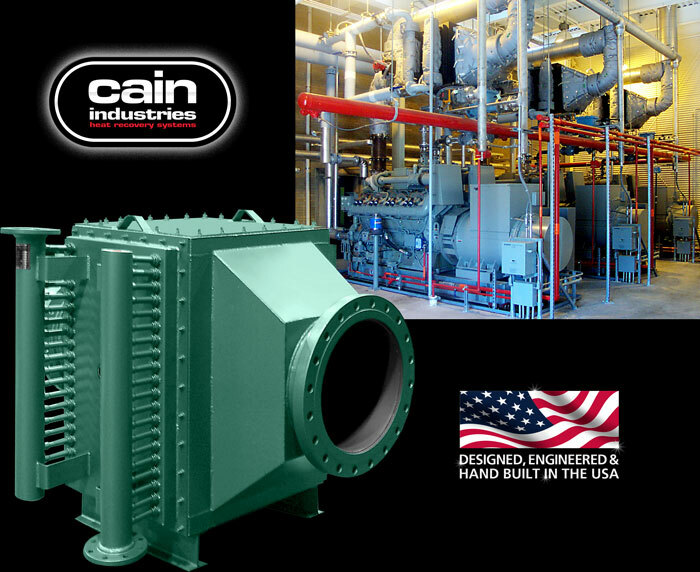 Cain Industries' engineering team is available to propose the proper system components at competitive pricing. Upon review of your application, you can expect our proposal within 48 hours. It will include professionally engineered details showing equipment costs, savings analysis, computer generated economizer performance, CAD dimensional drawings, flow schematics, warranty, and a performance guarantee. 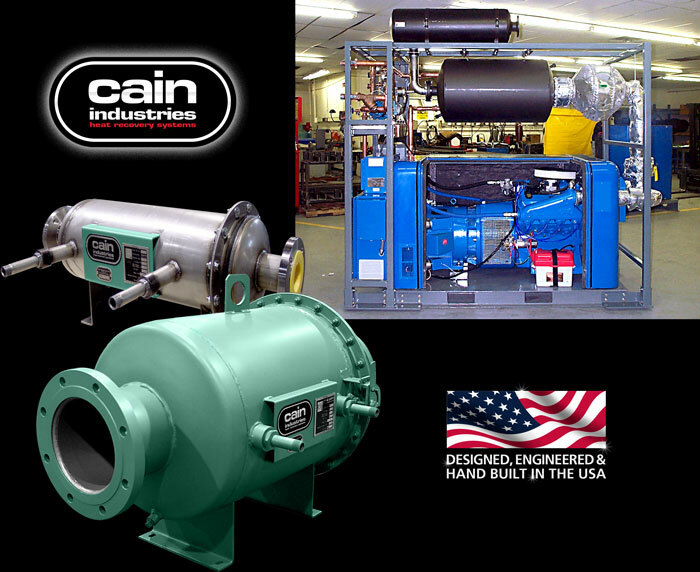 No matter how small the micro-turbine or how large the engine, Cain Industries has the heat transfer equipment, optional components and years of experience to provide the best solution. The Exhaust Cooling Steam Generator (ECSG) as designed to produce low pressure steam (15 PSIG and under) from engine jacket water via natural circulation. They are available in a variety of tank sizes for horizontal or vertical installations. Standard design includes: ASME stamped steam flash tank built in accordance with Sec.VIII Div.I; shipped as a packaged unit including continuous water level feed control with low water cutoff, auxiliary low water cutoff, excess steam pressure switch, gauge glass assembly, surface and main blowdown assembly, vent valve, steam safety valve, steam pressure gauge, wall or floor mount. Basic customer connections for ease of installation include: 150# steam outlet, 150# water outlet, 150# water/steam inlet, NPT Blowdown, and NPT Boiler feedwater. The unit shall be pre-piped and wired for a single 120v 1ph 60hz customer power connection. 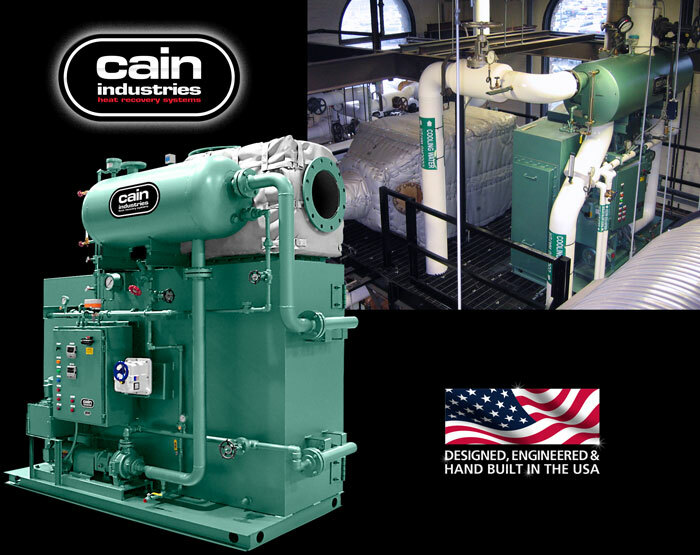 Cain Boiler feedwater systems are available in a variety of tank sizes, feedwater pump configurations, and optional water treatment assemblies. Packaged assemblies include: heavy wall tank as mounted on a 5' high rectangular tube structural steel stand with water level controls and low water cutout, gauge glass and thermometer, magnesium anode; (2) 2" NPT vents; 2" NPT condensate return; 1" NPT drain with shut off valve; Duplex or Triplex boiler feedwater pump system; electrical control panel fully pre-wired with fused disconnect switches, magnetic starters, manual start-stop switches and indicating run lights for feedwater pumps and alarms; all interconnecting wiring from electrical control panel to each component, optional chemical feed system, and/or automatic water softening system; all interconnecting bypass piping, valves, gauges, fittings, etc. Primed, painted, and tested package is a complete, properly functioning assembly, ready for the customer’s primary connections of water, condensate return, and electricity. 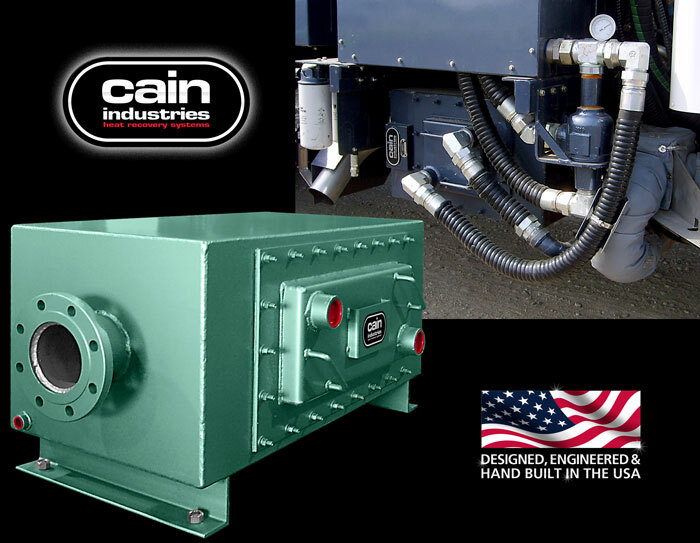 Cain Industries offers total exhaust gas control with high temperature modulating bypass and shut off valves. The valve assemblies offer precise exhaust temperature control and/or the design capability for exhaust isolation. Sizes ranging from 4" to 40" diameter are available in carbon steel and stainless steel for all engine temperatures. All valves are available with either electric or pneumatic control actuation and emergency fail safe features.